Reviewed: new North Korean Restaurant is Kim Jong-YUM! 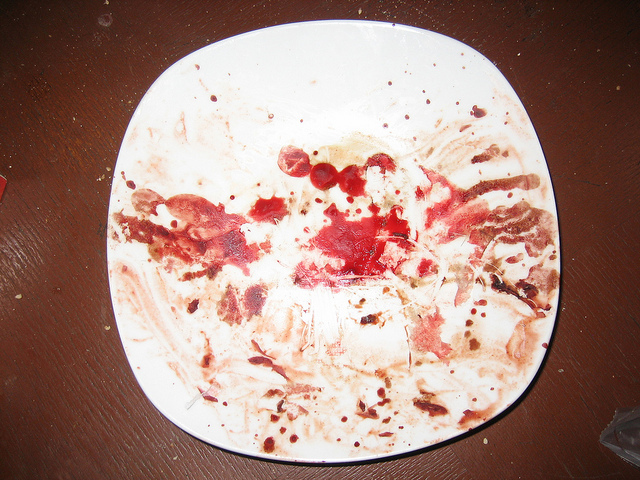 maybe photograph the plate before you eat the food next time? Hungry Haroldites have a tasty treat in store, in the shape of a new North Korean restaurant. Appearing overnight in the unit where ‘Brenda’s Puppies’ pet shop used to be, ‘The 38th Parallel’ also took over most of her remaining stock. And while their marketing might be seen as a teensy bit aggressive, you can’t knock the forced enthusiasm of their hundreds of waiters! Thrift fans will love the two-tier menu, which offers something for any budget. Choose from two types of rice from the ‘People’s board’, or sample the wildly exotic off the ‘A La Supreme Leader’. I was starving by my standards so I ordered something fit for a living God: a delicious and motivational soup of Jung-Un’s tears, followed by teriyaki unicorn and a generous slice of Standoffee pie. Did I mention the enthusiastic staff? 23 waiters brawled for nearly an hour over the right to serve me my starter. I almost felt a little embarrassed by their over-attentiveness. All spoke highly of the venture’s enigmatic manager, although a couple that didn’t smile as they did so were dragged off to a shed in the car park. Business is so good they’re considering taking over the US-backed ‘Seoul Food’ next door, although negotiations have entered a stalemate. Would I eat here again? Unreservedly, you’ll see me at the 38th Parallel every day from now on. At least until they give me my children back.